At the surface of your mind, you suffer over every little thing, and you have great anxieties about your future and well-being—always the fear of future loss, always the fear of the innumerable things that can happen to you and to those that you care [for]. The shock of the future will be a shock because you are unprepared. You have not been paying attention. You have been obsessed with other things of little or no significance. You have been caught up in the affairs of the day and in your own feelings and memories and regrets, not mindful of the world around you. With preparation, there is no shock. There is only confirmation. Even that which is shocking will not overwhelm you. It will surprise and dismay you perhaps in the moment, but you will not be overtaken by it. You will not be paralyzed by it, frozen in fear without any idea of what to do. When the ship begins to list and take on water, you will be ready. You will not be frozen. You will not go down with the ship. God has given you the power to save you, not only from calamities in the world, but from every disaster and every miscalculation that you can make and experience along the way. You may pray to God for many things—for protection, for advantages, for a happy outcome—but God has given you the greatest possible gift. But if it is unknown or resisted or neglected, what else can God do for you? But who is paying attention? Who is realizing the cause and the effect? Who is listening to the power and the presence that resides within them? The future shock is for them right now—the shock of realization, the shock of having to turn your life in a new direction, the shock of realizing how little meaning and purpose have been in your life previously and how you have wasted yourself, your time and your valuable energy on things that had little or no promise. Once you have turned this corner, if you can turn this corner, then you will be able to face almost anything. Though you may experience shock and dismay in the moment, it will not overtake you. Knowledge will become your foundation, and it is not shocked by the world. It is not even of the world. It is here to serve the world. At the surface of your mind, you will continue to suffer over things, but they will be things of greater importance and significance, greater meaning and consequence, instead of little things that have no future and no destiny. Everything you value—your future, the people you care about, even your own life—will depend upon this. It is not looking with fear. It is not living in a state of trepidation. It is looking with clear eyes, with the power and the presence of Knowledge. That will make all the difference in whether you can see or not and whether you will look upon the world with dread and anxiety or with certainty, compassion and determination. Let the foolish be foolish. Let the ignorant be ignorant. Let the self-deceived be self-deceived. Let those who are lost in their opinions be lost in their opinions. Look for those who can respond. Look for those who can get off the [sinking] ship. Look for your true allies. For you will need strong companions now. You cannot be circumscribed by the weak minded and those who are too afraid to proceed. This will change everything for you, as it must change, as it needs to change. It is the blessing of change. It is the difficulty of change. It is what will make you strong and powerful. Do not think it will be easy, for it will not be easy. Do not think it will happen right away because it is a process of many stages and steps. Do not think that you are there already, for you do not know what you will have to face. They are not lost in their hobbies or their romances or their obsessions, only to be overwhelmed in the last moment. They do not follow the consensus belief. They do not follow what they are told by the leaders of government or religion. They do not follow the general opinions because people are blind and are not paying attention. They are not afraid to face challenge and difficulty, and so they do not pacify themselves with false assumptions. They do not take their cues from the weak and the fearful. The gift of God is for everyone. The power of Knowledge is for everyone. But who can respond? The gifts of Heaven are for everyone, even living in a difficult and calamitous world. But who can receive them? Who can change their life and perspective to be in a position to experience this? Even here the shock of the future is a gift—a gift of redemption. Awaking from one’s own fearful Separation is a tremendous event. It calls the powers of Heaven to you who are beginning to awake. Let Knowledge be your guide and let the world tell you where it is going and what is emerging on the horizon. Be watchful. Still your mind. Set aside your desires and your constant fear by taking the Steps to Knowledge. 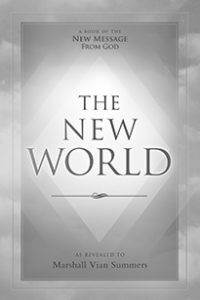 Receive the Revelation, the New Message for humanity. You are blessed to even know of this. You are blessed to hear Our Voice. You are blessed to be shocked. You are blessed even to be disappointed, for this disappointment can free you from the past. You are blessed to be freed. You are blessed when people leave you. You are blessed when things fall away. For this begins to set the stage for a new life and a greater commitment and relationship with the Divine and with yourself and with others.